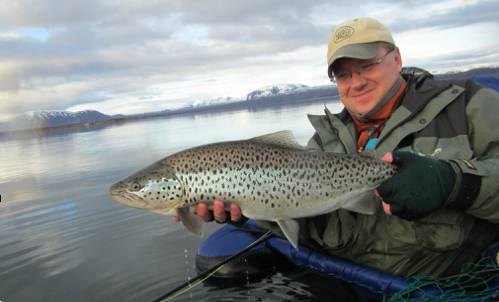 My experience with lake fishing comes from Iceland, where we only have Brown Trout and Arctic Char in our lakes. When trout fishing lakes the trout can take the bait very subtly. We feel a very gentle movement, sometimes hardly noticeable. Sometimes I just strike because of a premonition. I pull short and hard with my line hand and simultaneously raise the rod tip. We call this setting the hook or striking. This is how “trouters” do it. 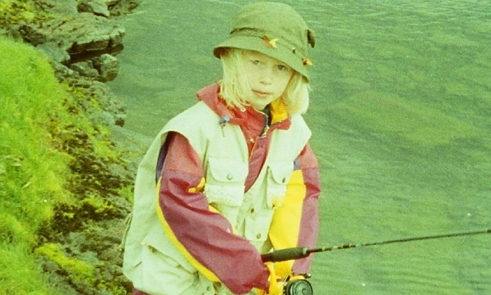 Beware, when salmon fishing – you do not raise the rod, or you will pull the fly away from the salmon. When you feel the weight of the fish you set the hook and then raise the rod. You must wait for salmon to take the fly securely, most “trouters” know this but will anyway pull the fly away from the salmon on their maiden salmon trips. Small fish do not need to be played from the reel, I just pull them in with the line hand. If fish are bigger I transfer the rod to my left hand and retrieve the line with the reel using my dominant right hand. Most Americans I fish with keep the rod in their dominant hand and reel with the other. Works both ways. I find lake fishing to be more difficult than river fishing. We need to get the line and leader out straight on the lake. When river fishing the flow of water helps straightening the line, and the fly travels correctly even if our cast was subpar. On the lake, we start by casting out the line and leader (I favor stiff rods because of that), as straight as possible, then we make one strip to get it straight and then we wait and then retrieve the fly before casting it out again. In moving water, the fish is in certain holding spots and does not move all that much. In a lake, the fish are searching for food and cruising for it. The angler needs to locate the fish. The moving fish are searching for food, but they also need security. That is why we often find them along edges. One side is shallow, usually more productive of food, as it warms faster than deeper parts. On the other side the deeper water offers security for the fish. When you get to a lake pay attention to what is going on. Do you see rises do you hear the splash of fish? Are there birds and are they working? Do not hurry, patience is usually rewarded. A 9′ #4-5 weight rod is sufficient for small trout. Heavier equipment is more tiring, and unnecessary and the flies are small. Fast light rods are my choice, but you can get by with any type of rod if you adjust your casting motions. A floating line is the way to go if there are fish in the surface. If there are no strikes you can lengthen the leader and tie on a bead head and fish deeper. We need to locate the fish, and additionally how deep they are. For that an intermediate line is a good choice as it sinks slowly when left alone and stays level when retrieved (so goes the theory). We can fish deep with that setup. 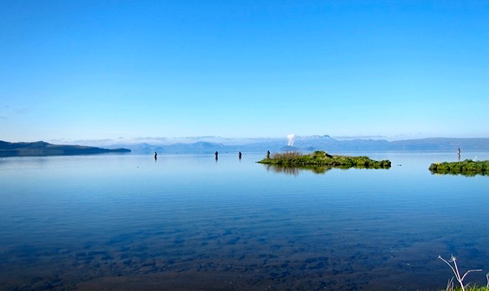 Full sinking lines have limited use in lake fishing. The new intermediate clear lines are a very good lake fishing choice. The fly line usually comes with a prefabricated tapered leader from the shop. This leader is around 9´ and we can start with that. After repeated change of flies it will shorten, and we add new tippet to it, and lengthen the leader if we choose to. What test tippet to use is a local knowledge, but I start with 5-pound tippet. We can always go thinner if no strikes. I favor rather stiff leaders and like to lay out the line and leader as straight as possible when the fly hits the water. Fish often take the fly just moments after it lands and if the line and leader is not straight I cannot strike, and that fish is not caught. Prefabricated leaders are not a must at all it is quite simple to build a leader from tippet bits of different thickness. The number of good trout flies is staggering. Beginners often think they need a hundred of different flies. “The new fly is going to catch, and I must have it” type of thing. Beginners are infinitely better served by making their casting a priority. You do not need more than 5-6 wet flies in different sizes and some dry flies to be successful. If one does not work, try another.